The AdderView AVX5016IPC-US is a kit including (1) AVX5016IP 16 port CATxIP Switch, (8) CATX-USB VGA USB dongles and a (1) RMK4S 1U 19" rack mount kit. This device offers 4 non blocking simultaneous IP connections together with a local port (5 separate users), and allows the user to control 16 separate devices. The AVX5016 IP is very small and compact enabling you to fit two units side by side to support 32 computers and 10 sessions in just 1U of rack space. 4 simultaneous IP users- Allows 4 simultaneous global users to connect via IP to any of the 16 connected devices. Local user support- Direct connection for 1 local user to connect straight into the switch. RS232 control- Integrated RS232 gives you the ability to control other external devices such as power management devices. Ecopulse circuitry- Ecopulse powers down unnecesary circuits when not required to reduce power requirements. Over the life of the product this will save significant power resources. Encryption and Authentication- This enterprise grade KVM over IP switch employs AES128 bit encryption and RSA2048 authentication ensuring your control system remains secure at all times. Configuration- The AVX5016 IP allows you to configure 16 separate users internally with unique access privileges all of which are stored within the switch. Open Arhitecture- Adder's continuous improvement policy further ensures your system against future hardware changes - Adder offers free firmware updates for the life of the product. Furthermore, Adder's open architecture design philosophy will not tie you in to specific manufacturer's equipment. 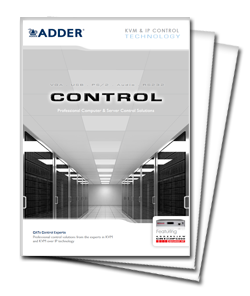 ADDER.net- Network management software, automating the task of managing your network control hardware. Up to 1600 x 1200 resolutions with scalable windows. The AdderView CATx IP 5000 provides exceptionally high video performance to local, and global IP users alike, supporting up to 1900x1440 resolutions (1600x1200 on IP links) with DDC emulation which is further enhanced by DC balancing to ensure full and true colour. Flash upgradeable CAMs are available for VGA, DIsplayPort, PS/2, USB and Sun keyboard and mouse support with optional audio. KVM communication from switch to target devices can be up to 10m (33ft). One local user, and/or four global IP user can control up to 16 multi-platform servers. Up to 16 different user profiles can be stored with access rights for each user defined. The AdderView CATx IP 5000 supports any computer platforms with PS/2, USB and Sun keyboard and mouse interfaces. Country code reporting, DDC and continuous keyboard and mouse emulation ensure faultless operation. AdderView CATx IP 5000 switches support CD quality 44.1kHz digital stereo audio when optional audio enabled CAM modules are used. The AdderView CATx IP 5000 can be switched using selectable keyboard hotkeys, an on-screen-display (OSD), or 3 button mice or the front panel controls. These switching options allow you to rapidly reasign connected devices to any of the connected computers. Expand simply by using just CATx cable to link units. The AdderView automatically detects cascade connections to support up to 256 computers. One or two CATx 5000 switches can be mounted in 1U of rack height giving a maximum of 48 ports per 1U. Small size also makes the units ideal for mounting behind KVM rack drawers. Power Supply Mains adaptor with IEC style power lead (included). Hardware Compatibility Video, mouse and keyboard for PC, Sun, Mac, RS/6000, Alpha and SGI computers using PS/2, USB or Sun flash upgradable Computer Access Modules (CAMs). OS Compatibility Operates with all currently known software and operating systems including all Windows versions, DOS, Linux, Unix, BSD, all Sun OS, all Mac OS and NetWare. AVX5016IPC is also known as the AVX5016IPC-US and AVX5016IPC-USA.